When I was about seven or eight years old, and living at 646 Market Street, we had some Polish people living above us on the second floor. They were maintenance men working for the trolley car service. Their job was to repair all the tracks and roadwork. They worked on a flatbed trolley car, which had a cab on each end from which they could control the operation of the car. The flat section was for sand, stone, railroad cars and miscellaneous equipment. Our neighbors were wood lovers. They would bring home any type of wood, cut it up, and use it for heating and cooking in their wood stoves. 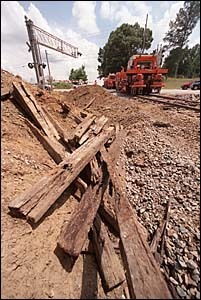 Whenever they replaced old worn-out or rotted railroad ties, they would bring the old ones home for firewood and heat. It wasn't long before they had accumulated a large pile of railroad ties in our back yard. They were stacked alongside one fence, about six or eight feet high. Being playful, the children in our house and in the neighborhood, loved to climb on top of these railroad ties and leap from one side to the other. That's how we children were in those days, always happy and playful, never thinking of safety, just as they are today. Well, one day a loose railroad tie fell down, and I went down with it. Another tie fell down on top of me, causing a deep cut in my head. I was bleeding pretty badly, and my parents, greatly alarmed, rushed me to St. James Hospital, located about two or three miles from home. It was a combination Catholic church and hospital. I don't remember how I got to the hospital, but the doctor sat me down on a stool, and with the assistance of a couple of nurses or nuns, tried to relax me or hold me while they put nine stitches in my head to close the wound. I can just see it now, plain as day. They had several nuns there, helping the doctor as they worked on me. I don't remember being given any anesthesia to numb the pain. They may have given me some, but I can still see them working on me. I remember every stitch. Thank God, my head is fine today, with no after affects.